Segnaliamo l’uscita del volume Co-Designing Economies in Transition: Radical Approaches in Dialogue with Contemplative Social Sciences, a cura di Vincenzo Mario Bruno Giorgino e David Zachary Walsh, pubblicato da Palgrave Macmillan nel 2018. Abstract. 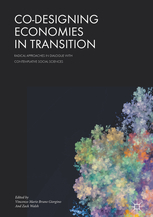 This transdisciplinary volume puts forward proposals for wiser, socially just and sustainable socio-economic systems in transition. There is growing support for the view that the end of capitalism is around the corner, but on which conceptual and ethical basis can we interpret these times? With investigations into feminist economics, post-growth environmentalism, socio-technical digital design, collaborative and commons economics, the editors create a dialogue between radical knowledge/practices and contemplative social sciences to transgress disciplinary boundaries and implement new visions of reality. This important book challenges our ways of thinking and outlines a pathway for new research.